We filmed the entire genocide trial of General Efraín Ríos Montt, gavel to gavel, and have produced Dictator in the Dock, a series of 24 webisodes (3-5 minutes each) that will immerse you in the high drama of the courtroom. We invite you to watch the Dictator in the Dock series in English or Spanish. At the conclusion of the trial, on May 10, 2013, General Efraín Ríos Montt was convicted of genocide and crimes against humanity, sentenced to 80 years and taken directly to prison from the courtroom. The trial convulsed Guatemala, setting off a fierce backlash from the country’s ruling elite scrambling to deny that there ever was a genocide, because when the genocide was officially acknowledged in a national court of law, it busted history wide open and questioned the very legitimacy of the elite’s power. In a legal maneuver reminiscent of the Jim Crow era in the U.S., the guilty verdict was “vacated” 10 days later by the Constitutional Court of Guatemala, fully exposing the apparatus of impunity. It’s certainly not the first time that law has been used to protect the powerful. 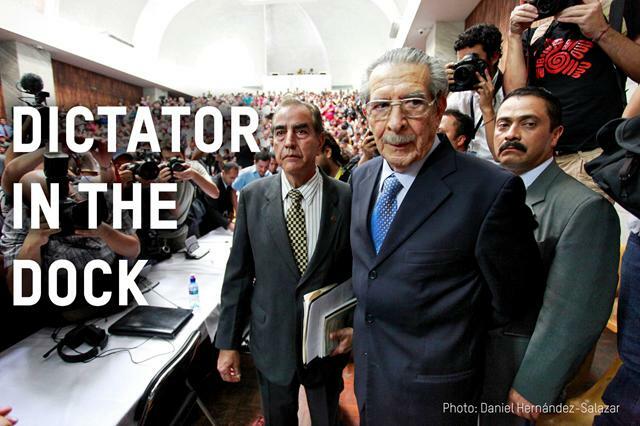 But the trial is set to resume, and General Ríos Montt remains under house arrest. Time will tell. Over the past 30 years, in our films When the Mountains Tremble and Granito: How to Nail a Dictator, we have told the story of the conflict in Guatemala and the struggle to achieve justice for the atrocities committed. Our next film about the Guatemalan saga, with this epic trial at the center of the narrative, will be titled 500 years.